Andrew Huff – A Man of Great Vision. How the first hotel in Gatlinburg influenced the formation of the Great Smoky Mountains National Park. Who would have thought the opening of an 8-room hotel in the Smoky Mountains in 1916 would be instrumental in the formation of the Great Smoky Mountains National Park? And who was this great visionary who built the tiny Mountain View Hotel? His name was Andrew Huff, the great-grandfather of Mrs. Nancy Hays, who along with her husband Mr. Jerry Hays, is the owner of Mountain House Inn; Gatlinburg Hotel. Andrew Huff was a transplant to Gatlinburg from Green County in 1900. He originally came to open a lumberyard and harvest the vast amounts of timber the mountains afforded. But somehow, he saw past a vision of dollars for himself and saw a vision of prosperity for everyone in the community. This vision ultimately provided an escape for the ordinary citizen, preserved not only the mountaineering lifestyle but the unspoiled mountain range, and provided an economic flow into his community that continues today; almost 100 years later. Visionary, indeed. Andrew Huff’s sawmill was so remote that in order to entice lumber buyers to visit he built an 8-room hotel, appropriately called Mountain View, to house and feed them. And so began the hotelier legacy for members of the Huff family. Once the buyers took back fabulous stories of “pure air, pristine views and mountain hospitality,” others became interested and wanted to see for themselves. By 1924, so many people were coming to visit the area that Huff added on to his hotel. He built a two story building with a large dining area and kitchen on the ground floor and more guest rooms on the 2nd floor. It must be nice to have your own lumber mill, huh? 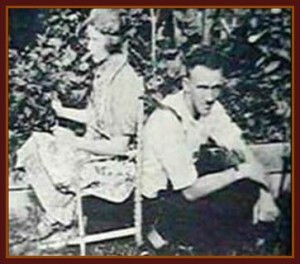 Mr. and Mrs. Willis P. Davis and Col. Chapman, both of Knoxville, were frequent visitors. It was they who chatted up the dream of a National Park with Huff, who bought into the idea completely! In an effort to help, Huff readily supplied room and board for visiting government or Park Service VIP’s, and provided horses and guides for their explorations of the area. With the talk of a National Park, the Mountain View Hotel was the center of activity and hospitality from 1932-1940. It became a revolving door for Park officials, the Bureau of Roads people, surveyors, photographers, and of course, outdoor-oriented tourists, who came as much for the views as to buy local artisan crafts. Apparently there was as much demand then for handmade brooms, quilts, died yarns, baskets, candles, food, and the many other handcrafted items still sold today. Andrew Huff believed in the marriage of the National Park Service to Gatlinburg so much he even built offices for the staff on the hotel’s property and a private home for the first Superintendent of the Park. Eventually, the deal was done and an official proclamation for the “Great Smoky Mountains National Park” was made on June 15, 1934. While Andrew Huff had sold his thousands of acres of timberland to the National Park Service, he had strongly advised his friends and neighbors living outside the park boundaries to keep ahold of their land; prosperity was a-coming! Clearly, the people listened, as many of today’s area businesses are still in family hands. Too bad the city council didn’t listen to his radical suggestion to build a six-lane road through Gatlinburg in 1940; it would have saved many headaches for travelers in the 1980′s-2000. I told you, the man had vision. Andrew Huff wasn’t done helping Gatlinburg become the center of East Tennessee. He became the driving force behind forming the first Hotel/Motel Association in Gatlinburg in the late 1930′s. At the time, the group consisted of just 4 hotels and 8 tourist camps. And, Andrew was a progressive hotelier! He upgraded the accommodations at the Mountain View Hotel throughout the decades. In the 1930′s he added “steam heat” to the rooms. In the 1940′s the “standard Gatlinburg hotel experience” came to include a fireplace and a private bath – all for $2.00 per person per night. And in the 1950′s, now known as the Golden Age of American Vacations, Huff installed carpeting and telephones in the rooms, and paved the parking lot. Over the years the hotel was host to many celebrities including Eleanor Roosevelt and Ken Curtiss and Milburn Stone of Gunsmoke fame. Remember how I said there was a Huff legacy of hospitality that began to be passed down? Well, while Andrew was enticing tourists to his “comfy” hotel, Jack Huff, Andrew’s oldest son, was more interested in offering guests an “authentic experience” of mountain life. So in 1926 he began building the “smallest hotel in the world”, two rustic cabins, without running water or electricity, located atop the highest mountain, Mt. LeConte, and of course named it Mt. LeConte Lodge. Mt. LeConte Lodge is still in existence today, and yes, you can make reservations to stay there, but you cannot drive to it, but instead must hoof it up the mountain – 7 miles – carrying anything you might need for your stay on your back! No whining, please! If, however, you are tempted to complain, consider this story about Jack and his semi-invalid, 90lb mother, Martha Whaley Huff (whose family, incidentally, built the 2nd hotel in Gatlinburg – the Riverside Hotel). Martha said she had always wanted to see a sunset from the top of the mountain. Determined to make it happen, Jack tied his mother into a chair, then strapped the chair to HIS BACK and hiked the FIVE HOUR, UPHILL trek to the top – and there was no “trail” then, not like there (sorta) is today! Now, feel better about your little backpack? Jack along with his wife Pauline, whom were married atop the mountain, and their children ran Mt. LeConte Lodge until 1959. That was the same year the Huff family sold the Mountain View Hotel to Mr. and Mrs. Herrick Brown (Andrew Huff had died in 1949), who began operating it under an arrangement with the National Park Service in 1960. The hotel closed in 1982 and was torn down in 1985; all in all, a sad ending for such a grand adventure. But never fear, it was not the end of hotel ownership for members of the Huff family. They still own and operate hotels in Gatlinburg; the legacy, and the vision, is still alive.